When Hollywood takes on a biblically-based movie, two things should immediately be expected; first, that embellishments will be on the extreme side of things; second, that the scriptural narrative will be bent to accommodate more familiar forms of entertainment. And those two are just for starters. Without so much as skin paint to make them look darker, the white cast made me feel like I was watching some Aryan conception of the beginnings of the white race. 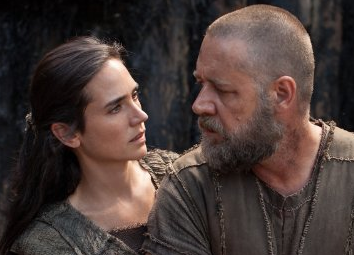 It should come as no surprise that any ancient Noah-worthy stand-ins would not be white. Not only does it poorly select its cast, but the movie misses the opportunity to exhibit some educational insights on how an Antediluvian people might have looked (maybe the cocoa dark mix of Anglo, African, and Asian features? Why not?) Instead, we get a movie prepared solely for white, preppy audiences because the creators seemed to think it would go over well that way (if that’s not the case, you propose a better answer). 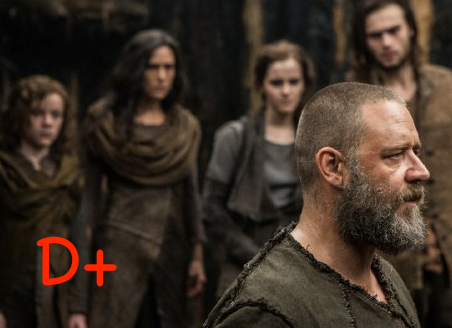 With Russell Crowe as “Noah,” Jennifer Connelly as his wife “Naameh,” Emma Watson as their daughter “Ila,” and Anthony Hopkins as “Methuselah,” it becomes quite difficult early on to take anything we are watching very seriously. There is one exception: Ray Winstone as TubalCain, the villain who could be considered a pre-instigator of the rebellion against God in Genesis (4:22-26). His is perhaps the only truly spot-on performance in over two hours of viewing. Connelly and Watson would come in second and third, respectively. The sky is wrong in this movie. According to Genesis, the early earth was surrounded by waters at the highest orbit, a canopy encasing the earth in a dome that would scatter and diffuse most light from the stars and sun (Genesis 1:6-8). Luminaries would only be visible at nights to serve as points of direction and guidance (per Genesis 1:14), but they would be hazier than they appear to us today. This is significant because rain did not fall before the flood, but mists watered the grounds (Genesis 2:5-6). No one really seems surprised when water starts falling from the sky at the flood’s inception. Where did that water come when the rains began? From this water canopy that collapsed, along with the massive fountains of the deep being released (Genesis 7:11; 8:2). From these, the earth was flooded. To its credit, the envisioning we get of water bursting from dry, parched grounds can border on impressive, but very little else does. Hollywood seldom recognizes the serious drama that appeals to more mature audiences, and so to prevent any reliance on that cash-squandering intellectual stuff, they decided to not rely on the bible characters to shuttle in that 110% drama we could have had. They ignored the potential for epic battle scenes between aged-but-genetically-superior survivors only a few generations removed from Adam, for the likes of rock-bound angels who feel like CGI-giants from something in Lord of the Rings. They serve an integral part of the movie, however, and even somehow seem not as nonsensical as much of what comes our way. These rock monsters are called “Watchers” and they are supposed to be a re-imagining of fallen angels imprisoned in earth. When the movie begins, we are briefed on the epic war between Methuselah and sinners in a violent, barren, fallen world. Mind you, this was one of the things the film does well. When we hear Winstone’s TubalCain speak – always ineloquently and bitterly – about the hopelessness of being left by God to die on a forsaken planet where nothing seems to grow, and where men turned to meat-eating since vegetation was scarce (according to scripture, this wasn’t until after the flood – Genesis 9:2-3), there are occasionally some sellable items here. In its blatant lack of concern for scriptural honesty, sometimes it threatens to entertain us. This is another thing Aronofsky got right. Instead of a deep, soothing voice from heaven, God speaks in clipped visions and dreams—many of them needing clarification by older, wiser men. If that’s not how religions start, how would they? Speaking of older, wiser men, Hopkins’ Methuselah is one of the lowest points of this whole movie. He is a creepy, goofy old man who snoops around trying to fill his craving for berries. Okkkkk! Some would say the movie does itself no favors by showing rows of different colors of birds and various animals being loaded onto the ark. But the way science divides up species makes this a problem, not the bible. Even though one primal bird can account for all different kinds to come thereafter, as one wolf makes ALL kinds of dogs to follow, seven of clean animals were brought to be sacrificed or eaten. Those that were not clean were brought in twos (Genesis 7:1-9). I found it interesting that the animals loaded into the ark were in hibernation (makes much more sense than having to have Noah and crew clean up waste remains for 23 hours of the day)! But nevermind that we know that a global flood is impossible, geologically speaking, it’s just wrong the way it is done. We never get a story that rises to the level in intensity or appeal. The expanded parts for Noah’s wife and Methuselah and some added-in drama concerning Ila’s barrenness did not help things. 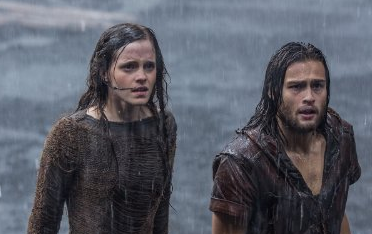 What shall we say about the movie Noah? Chiefly, it is a film of missed opportunities. The Good: It emphasizes the humans as outcasts, broken by the grueling work needed to survive in a harsh, barren land, as well as warring between the godly sons of Seth and the wicked offspring of Cain. As pointed out, this is in accordance with scripture going all the way through Genesis 6, but it is the human elements that could have utilized a ton more development and a more flushed-out power struggle between the leaders. Indeed, a whole new vision was needed for this film. The Bad: Miscast, embellished and cheap appeal to less discerning viewers, not focused on its source narrative, questionably written, and a little boring. The movie feels almost as long as it is. This is not to say that it is not very dark when it needs to be, and very human. In its bizarrely irregular focus, too much comes into focus, and at the expense of the integrity of the narrative, we lose most, if not all, interest. The crisis of conscience on the part of Noah – incidentally showing the fanaticism of faith – was a commendable little bit—or it would have been had things been manageably broken down. But even after the flood, Noah is not portrayed as an alcoholic, nor do we see anything with regard to the sin of Ham (Genesis 9:21-29). It ends as oddly as it began, leaving us with not knowing how to feel (if we aren’t openly disappointed). Noah, Daniel, and Job were listed as being among the greatest examples of righteousness (Ezekiel 14:14), but the movie gives just bits and pieces of what could have been expanded upon to reveal a man of not only great conviction, but one who lived in a time where the world was different…grander, more impressive, more genetically pure…which would naturally have led to yet more opportunities to use CGI in a more impressive fashion than what we are given.